If you have ever looked at yourself and then at others around you and seen how much you resemble some, in shape, size, skin tone, personality, etc. and then also seen how certain individuals are completely different than you, then you have literally witnessed what a dosha is in people. This energetic difference we see, sense, and experience are the differences that make you "uniquely you". I remember when I was first dabbling in Ayurveda (reading Deepak Chopra's book "Perfect Health"). I was reading about appropriate exercise for someone who is Vata, as I am. I was flabbergasted to discover that there are practices in the world where VO2 Max and exercising at 60-90% of your max heart rate aren't necessarily desirable. My eyes bugged out when I read "if you begin to sweat, please relax into a more soothing posture." Bound to become a couch potato was the first thing that crossed my mind. Cottage cheese. Wow. Contrary to what I have known, and worked my bee-hind off to accomplish most of my life, this "getting a great workout" thing, feeling the sweat drip into my eyes until they sting... What do you meeeeeeean, people don't "just do it" all over the world? Now, hear me right. There are those of us who benefit from strong, energetic exercise programs (Pitta), and then there are those that are best suited for moderate exercise that can be sustained and get them moving (Kapha). The key is that we realize what is best for each of us and then do our best to select lifestyle practices, including diet and exercise that nurture us toward balance and healthy living, rather than selecting ways of being that contribute to our plaguing imbalances. Simply put, if you feel "out of balance" or habitually exhausted, or moody, or stressed out, or constipated, or bloated, or itchy, or mentally "foggy" or, or, or... there just might be something here for you. On Fran's site, you have free access to a wide variety of healthy recipes that offer variations at the end of each recipe to enhance your dosha. Everything I have made from her site has been delicious. The sky is the limit. All this to be said, and I can't say enough about how grateful I am to be here. My skin rash (pitta out of balance from both my constitution and the ways I have done my life in the past) has cleared up, as I knew they would. Hives are all gone, as I knew they would be. And as Parmahansa Yogananda says, "Even when you are feeling ill, believe that you are well. An unwanted stranger will eventually leave". In addition to settling in and feeling better, my nights are sound, our meditations, pranayama, yoga practices, walks, and scrumptious vegetarian meals prepared by Nyoman are balancing and nourishing, and best of all, my heart feels light. It's a gift to have no television and no cell phone. In fact, the land line in our house is an old curly-cord phone with a short in the connection, so I have to use it only for moments at a time b/c I have to stand perfectly still and directly over it. Isn't that cool? May you do something good for yourself today. Something that inspires your heart and balances your body. It is truly an honor to take care of this body, isn't it? Yesterday, Larry and I went for a nearly 4 hour walk with the high priest of Penestanan, Karma. He has land that he wishes to "contract" or lease for 20+ years. We walked through many, many, many, many rice fields. We stopped at a small house, where Karma told us he goes three days before the "big moon" and three days after the "big moon" to sit and watch the moon at night. Land here is their only real asset, so "selling" is really only done out of desperation. 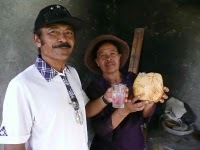 The Balinese prefer to keep their assets within their families, and to keep some control of the land in their village. So, instead, they contract the land for long periods of time, after which, the property one builds on the land becomes the property of the land owner, and then he can negotiate a new lease, if he so chooses, but it is much more valuable because now there is a building on it (never mind who built it). We went on this trek with the high priest because he came by for a visit and was referred to us by Bob, the owner of our house. It was an honorable visit and we did not want to offend. And so, we walked. Loving you all from across the globe.